With my wife out of town on a two week holiday to Hawaii for scrapbooking, I finally took some time to get to work on the layout. Of course, also good that Dan and Cam were willing to help. 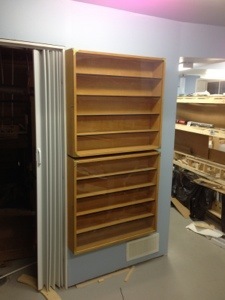 Some time ago, I acquired a couple display cabinets from another model railroader who was moving and downsizing. After sitting in the basement since spring, I finally have them installed on one of the unclaimed walls. And then we got some work done on the trackboard into Dominion Tar & Chemical, drawing out where the main and the spur are going to go. Room for a 3 car spot plus a little more. BC Pole was also factored in and then since I could do some of that stuff on my own at a later time, figured on getting more of the benchwork done which does require a few more hands. And with that, we installed benchwork around the “nose” of the basement (south end) for the lower deck, and we now have the basic shape for Courtenay. We also found better spots for ICG in Courtenay, along with the team track across Cumberland Street from the station. 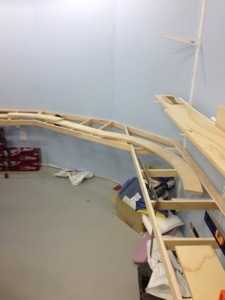 We ran out of usable 2″ wide plywood, so we’re not quite done with Courtenay’s benchwork, plus I’m needing to install a narrow shelf into the stairway for the escape track out the extreme north end of Courtenay’s diminutive yard. 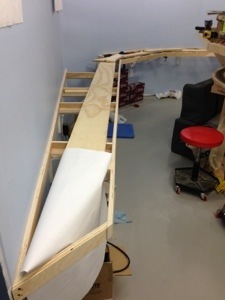 Next weekend, I should be able to acquire more plywood in the correct dimensions and carry on with the task! Of note, it would appear Layout Tours for the CMRS have been moved up into March… If I’m going to have the Victoria Sub portion of the layout operational by then, I should get a move on! This entry was posted on November 12, 2012. It was filed under Basement Development, Benchwork.